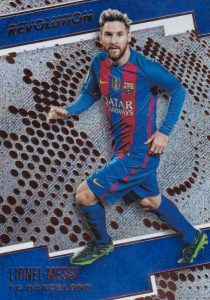 Transitioning over from the basketball brand, 2017 Panini Revolution Soccer maintains the formula that stresses colorful inserts and parallels over traditional hits. Each box of the debut release includes at least one parallel numbered to 100 copies or less, as well as a solid shot at autographs. Covering 28 top clubs across 14 countries, the base set totals 200 cards. Up to eight different parallels tweak the coloring and effect including the numbered Cosmic (#/100), Magna (#/49) and Disco (#/25) editions. Among the most rare are the Galactic parallels which average less than one per case. 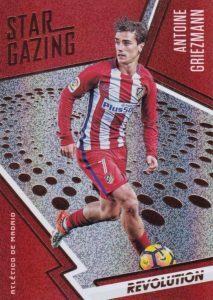 2017 Panini Revolution Soccer also has a decent variety of standard inserts that combine to average five per box. On the Rise documents up-and-coming players and adds six parallels with three being numbered. Revolutionaries provides the first Panini cards for Thierry Henry, among others, and Star-Gazing honors 30 of the best players on the planet. Averaging two per case, Showstoppers also features elite players and includes a Galactic parallel. 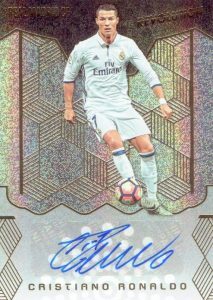 While signed cards are still in play, they average around 1:3 hobby boxes of 2017 Panini Revolution Soccer. Led by Cristiano Ronaldo and Diego Maradona, the Autograph cards are issued in base versions and three parallels, numbered to 49 or less. PARALLEL CARDS: Astro, Fractal, Hyperplaid, Infinite, Sunburst (Retail), Galactic (1:128 packs), Cosmic #/100, Magna #/49, Disco #/25. Base odds - 1:23 packs, on average. Short Prints noted: SP* = 100 copies or less; SSP** = 25 copies or less. PARALLEL CARDS: Astro, Fractal, Galactic (1:730 packs), Cosmic #/100, Magna #/49, Disco #/25. 20 cards. 1:64 packs. Shop on eBay. PARALLEL CARDS: Galactic (1:913 packs). PARALLEL CARDS: Astro, Fractal, Galactic (1:609 packs), Cosmic #/100, Magna #/49, Disco #/25. PARALLEL CARDS: Magna #/49, Disco #/25, Kaleido 1/1. I went nuts and opened up 17 Hobby cases. This has a lot of short printed cards and ( color errors in the “Astro set ” YOu will notice it in the upper right hand corner the coloring will be different or Mis cut. In Every Case you got the following 1 Star autograph or SP Or VSP autograph. 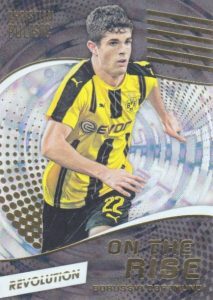 2 hyper plaid , Any case that you got 7 common $20 autographs you would get an extra Galactic card Out of 17 cases I only got 21 complete sets , 7 of sets were all missing card #113 Martin Skrtel, Fenerbahce SK. Astro 168/200 – Fractal 107/200 – Infinite -147/200 Cosmic 107/200. Show Stoppers Missing #19 Over all I think this is the best product on the Market for Breakers and investors , This is a first year set and is sure to increase in value. 2016 17 PANINI REVOLUTION SOCCER HOBBY 16-BOX CASE - AVG 8 AUTOS PER CASE!